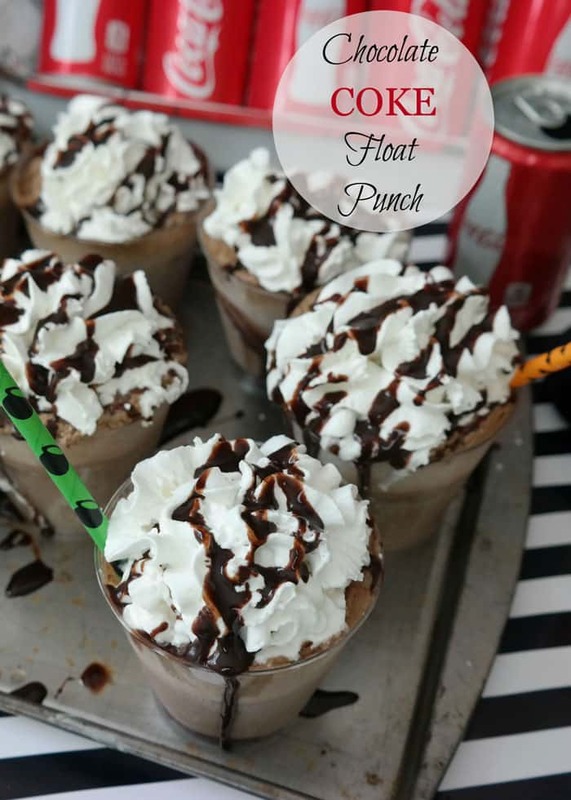 Chocolate Coke Float Punch - Chocolate Chocolate and More! This is a sponsored post on behalf of BlogHer and Coca-Cola, all opinions are my own and I only share things I truly love. 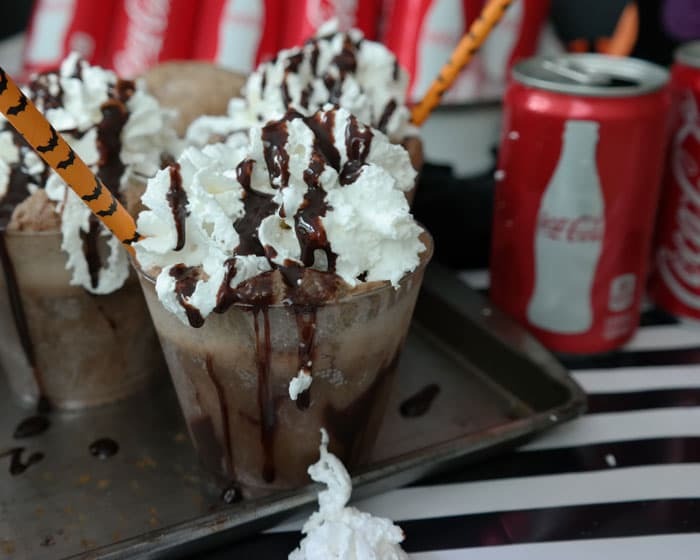 Chocolate Coke Float Punch-chocolate ice cream and Coke were a match made in heaven! 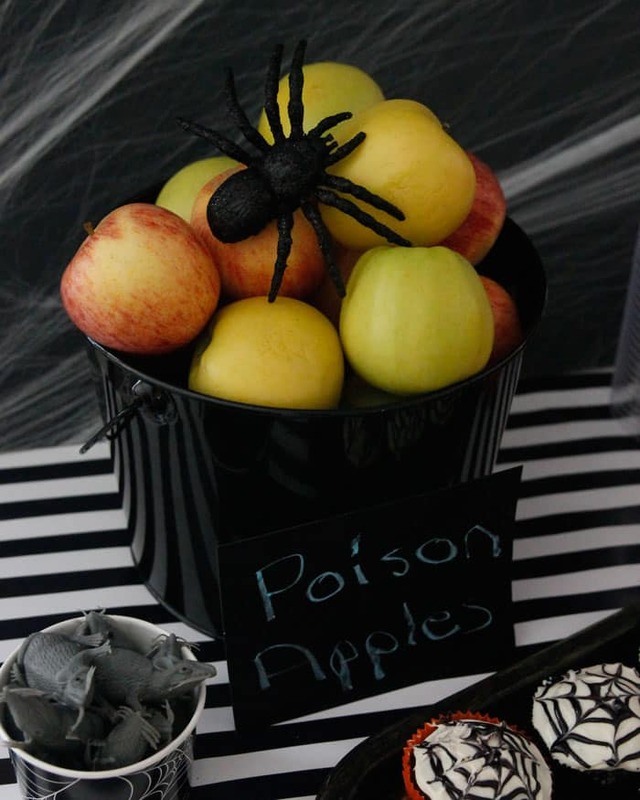 Create a magical punch for your Halloween party! Halloween has to be the funnest (I know, I know, I could use a better word, but I’m channeling my youngest) time of the year. 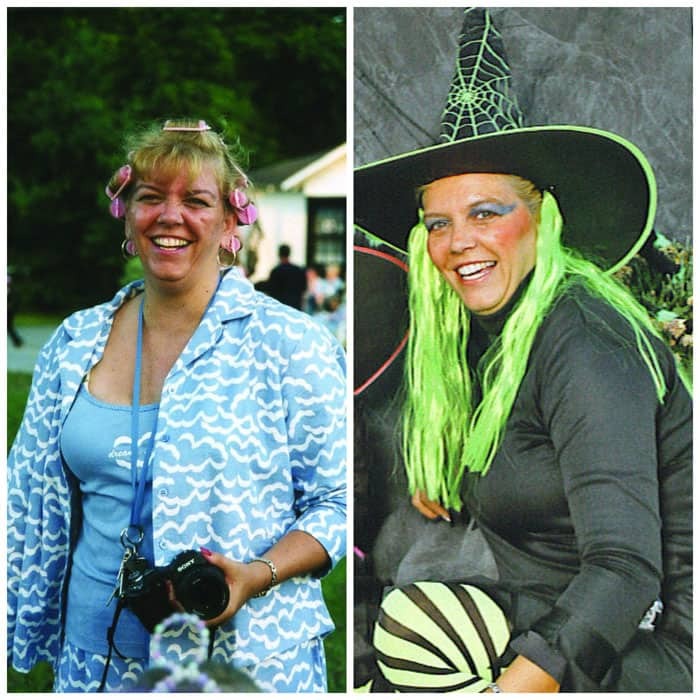 It’s all about getting dressed up in costumes, princesses, zombies, witches, superheros…some people get so creative. I still remember one year, a little girl covered in purple balloons, she was a bunch of grapes! My kids are now at the gory stage. Black make-up and blood. The more the better. Thank goodness it washes off. I like to get into it too. Yes, one year I was lazy and just wore my pajamas. I did have the cutest curls the next day. The other great thing about Halloween is the treats! In our small town, the kids either go to Main Street where all the businesses gather to give out candy (for our small town of 5000, we can have 3000 or more show up for this event!) Or it’s a party at someone’s house. Sometimes it’s both! Trick or treat and then end back up at someone’s house. Here are my tips for a great, easy party. You don’t have to spend a ton on decorations. My table cover is wrapping paper! Found on clearance, it’s glossy so you have time to wipe up spills and so much nicer looking than something plastic. (I also have plenty left over for actually wrapping presents later.) The dollar stores are your friend. A few plastic spiders and rats. I went with black paper plates, black and white napkins and clear cups, all can be used for other occasions. 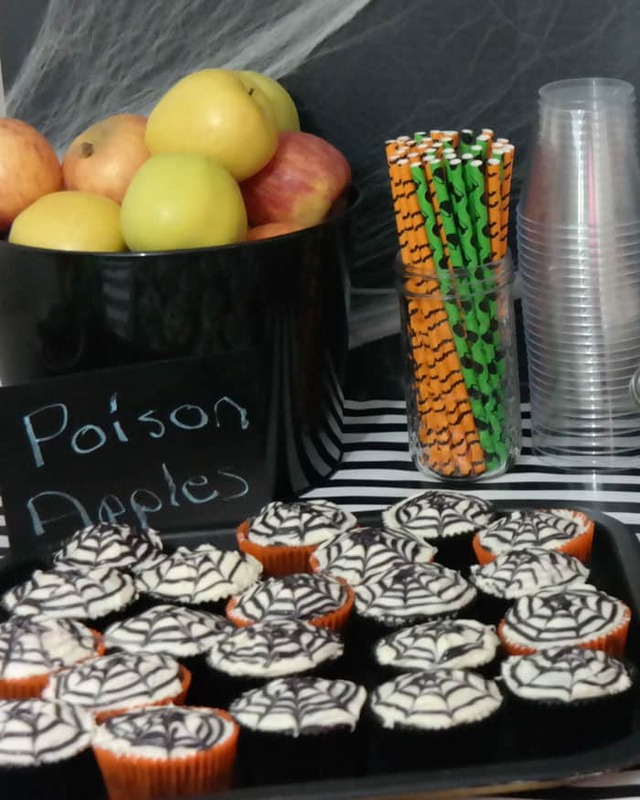 I did go with the Halloween straws, I just loved the colors. The tray with the cupcakes on it was 49 cents at a thrift store, It used to be yellow with some horrible design on it. I used some black paint I had around the house. Oh, and that spider webbing stuff. It goes a long, long way. I’m still using up a bag from 5-6 years ago. Use it sparingly as it sticks to everything when you’re trying to clean up. You’ll find wisps of cobweb in January still hanging about. Keep it simple. Less is more. You don’t need to have tons of food. Just a few items-a little sweet, a little salty, even a little healthy will be more than enough. 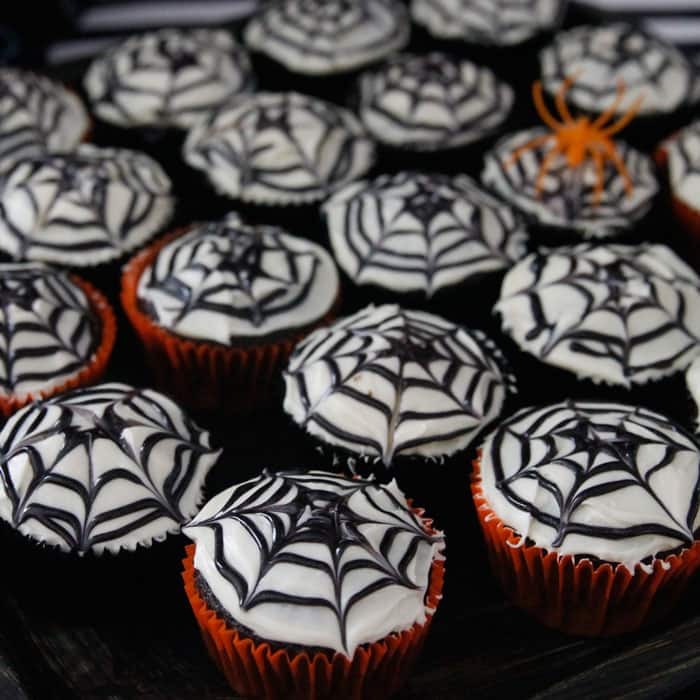 Chocolate Coca-Cola Cupcakes with a spiderweb design are so simple to make. (see below the recipe for a how to) A medium bowl (not large) of pretzels, you could do chips too. It’s better to refill than let it go stale. Apples! So easy to add a little sign and give them some personality. That’s just a square of black construction paper written on with chalk. And any leftover apples will make a great pie or homemade applesauce the next day. Keep your drinks smaller too. I love the Mini Coca-Colas, just 8 ounces. Easy to grab one and keep going. Easier for smaller hands to hold. I use a 9 x 13 baking tray for holding the Cokes. I set them up earlier in the day then pull them straight from the fridge to the table! Have one focal point. 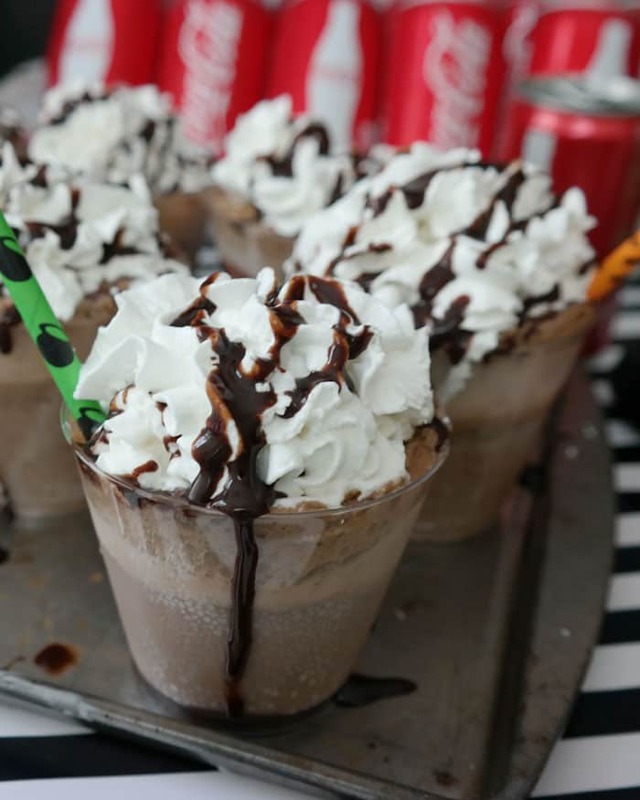 Chocolate Coke Float Punch! You could make this punch in a large bowl but making them as individual servings means everyone can get in on creating some magic. Have your ice cream already scooped into plastic cups and in the freezer. 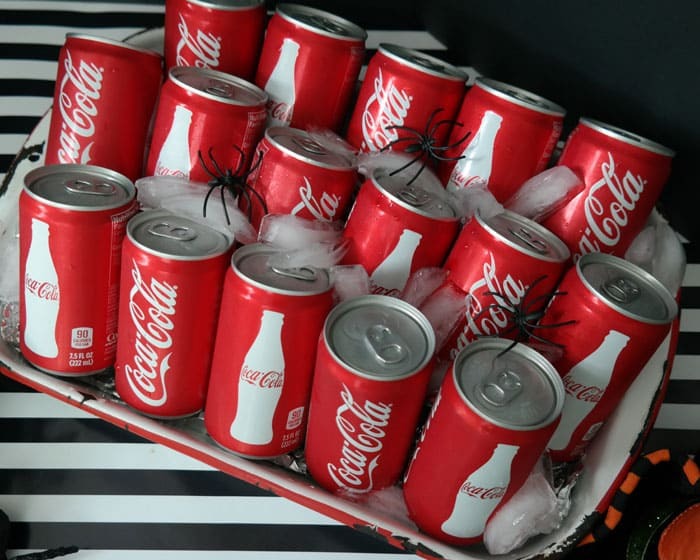 When party guests arrive, let them create a “witches brew.” Have each child grab a Coca-Cola Mini and add their “magic” to the punch. 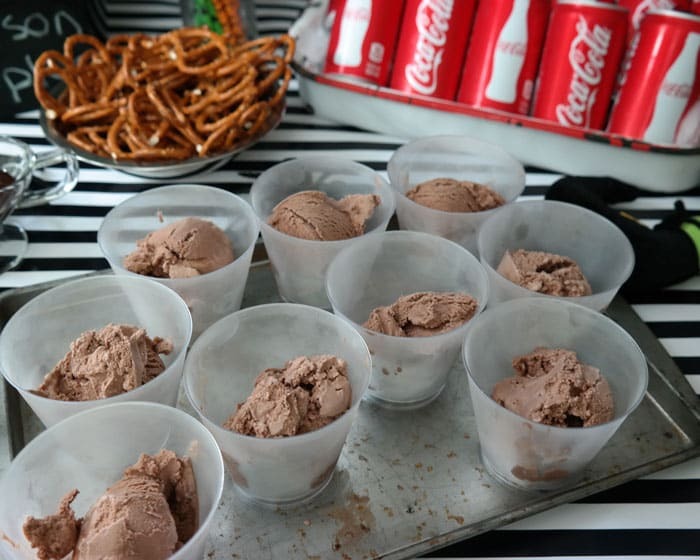 Coca-Cola and Chocolate Ice Cream are a magical combination. 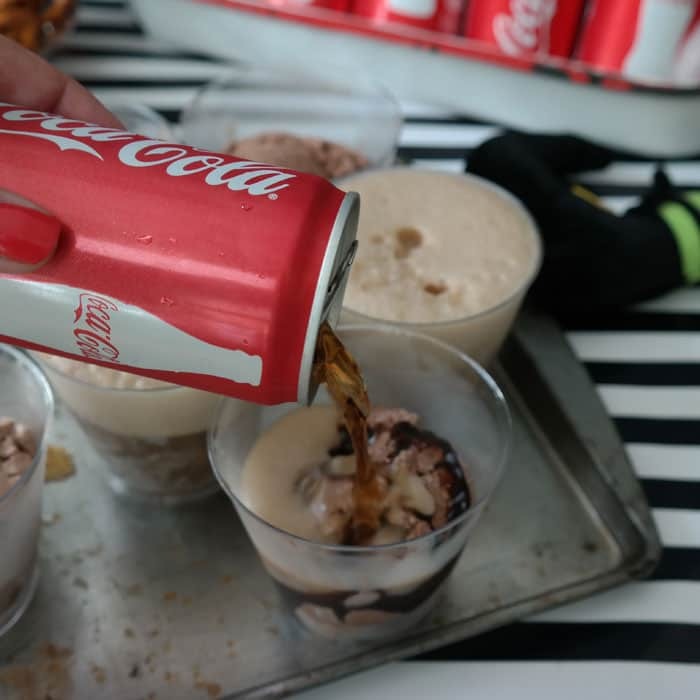 As you add more Coke, the foam will rise…and rise! Better than any party game you can come up with! Be sure to let your punch sit for a few minutes before serving as the foam will continue to rise as the “magic” happens. Then top with some whipped cream (go ahead and use a canned whipped cream, make life easy!) Drizzle with a little more chocolate syrup and magic! Things can get a little messy when the kids create their own but isn’t that half the fun of it? Place 1-2 scoops ice cream in each plastic cup, enought to fill about half full. Drizzle chocolate syrup over top of ice cream. Add Coca-Cola, until filled to 1 inch below rim of cup. Foam will rise above top rim but won't spill over edges. 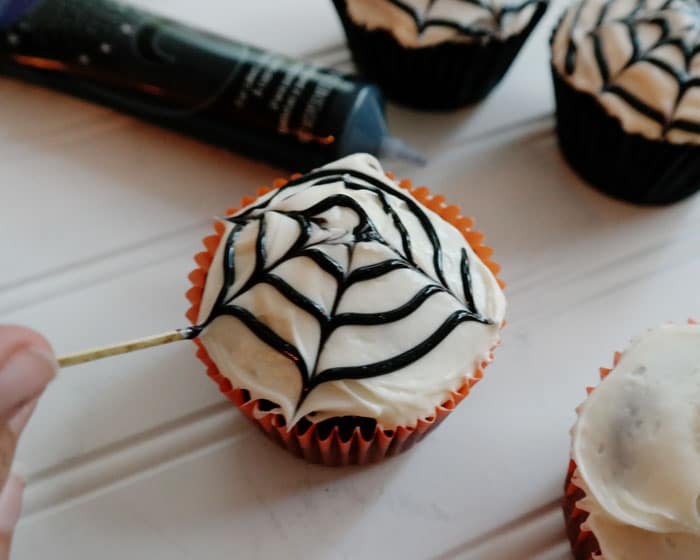 To create the Spiderweb on your cupcakes-frost with white icing then create a swirl with black icing (it’s easiest to start in the center and work your swirl out.) Use a toothpick, starting in the center, and drag to the outer edge. What great party tips do you have? I love all these ideas!! I’m so boring at Halloween, I need to step up my game. Oh my! 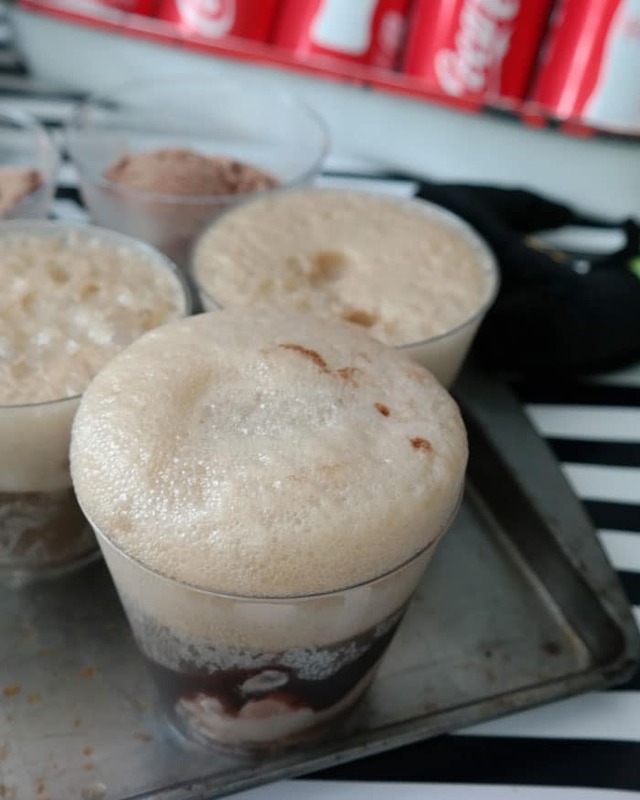 I love the idea of a chocolate coke float! It’s perfect for a party. Plus your old halloween costumes are awesome! This looks interesting. Although I’m confused about the title. This is not a punch, so why use it in the title? You can make this in a big batch in a punch bowl as well.